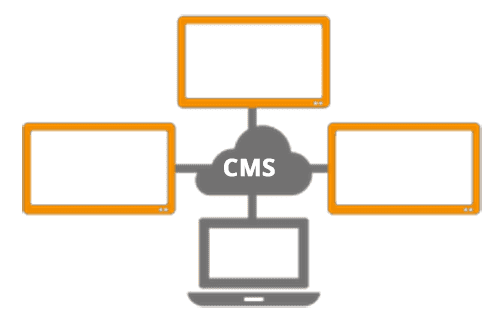 A digital signage content management service (CMS) is used to publish–upload and store–multimedia content and provide the means to display this content on your TV points. In this article we will present PowerSignage™, a digital signage CMS specialized for managing and displaying PowerPoint presentations on your TV. The digital signage player displays your content on the TV screen. Typically the player plugs into the TV’s HDMI (or other video) input and has built-in networking that supports connectivity to the CMS. Our PowerPlayer product is an example of this type of digital signage player. Before content can be displayed on any TV point it must be uploaded (published) to the CMS. The CMS provides a central repository for this purpose. And it’s through the CMS that users assign which presentation gets displayed on each TV point. This is its primary purpose. The digital signage player is responsible for accessing content stored on the CMS and displaying it on the TV screen. This is it’s primary purpose. PowerSignage is a cloud-based digital signage CMS. It manages the display of PowerPoint presentations on your TV points. PowerSignage is web-based–all you need is a web browser to access it. With PowerSignage users create content with PowerPoint. There’s no complicated software to learn. You create multimedia content by combining text, fonts, pictures, animation and HD video using PowerPoint’s drag-and-drop screen layout features. PowerPoint makes it easy to create interactive kiosks, digital menu boards and retail signage. Users upload their PowerPoint presentations (the content) to PowerSignage CMS. Once uploaded, PowerPoint presentations can be assigned to one or more TV points (or TV point group). PowerSignage CMS provides cloud storage, supports signage TVs at multiple locations with flexible display scheduling. You can display a PowerPoint presentation continuously (24×7) or by date, time and day-of-week. PowerPlayer supports landscape and portrait display orientation in full HD. PowerSignage CMS and PowerPlayer work as a team, providing users with an easy way of creating, managing and displaying multimedia PowerPoint presentations on one or more TV screens. PowerPlayer provides a complete, low-cost digital signage solution for small- and mid-sized businesses. We provide digital signage hardware, software and content management. For more information about PowerPlayer and PowerSignage CMS please visit our website at www.powerdigitalsignage.com.